We welcome you to our website. It is intended to be a source of information about Agudas Achim for members and visitors. We are a Reform congregation with a traditional soul located in the beautiful Catskill Mountains of New York. Agudas Achim means “gathering of brothers and sisters”. It was named over 100 years ago and still applies. Our hope is to facilitate the spiritual and intellectual growth of our members. Rabbi Pomerantz challenges us by gain new insights into ourselves and our faith. Our Cantorial team of Ira and Julia Levin and, for the High Holidays 5779, Cantor Kathy Barr, inspire us with both their spiritual and musical talents. Agudas Achim provides all the essentials of a Jewish community. You will discover this by exploring the contents of the website. We are especially proud of the high quality learning experience we are able to provide our children because of our excellent and loving teachers. We conduct monthly Shabbat services on the first or second Friday. Special programming to enrich our community are conducted periodically. Please view our calendar for the dates of our specific events. Our door is open wide to interfaith families and those who are searching regardless of background or belief. 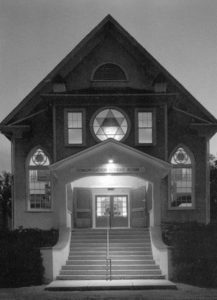 You are invited to visit our historic synagogue and experience our growing, friendly community.